Cross reference your portfolio holdings with hedge fund ownership to avoid crowded trades and to identify potential partners. Utilize our institutional Unusual Event Alerts to monitor the latest 13D (activist) and 13G (passive) activity at your companies. 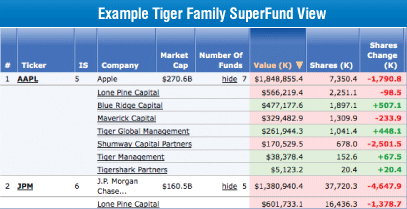 Screen over your investment universe to see which companies have the largest accumulation and distribution by hedge funds, mutual funds and other institutional investors. 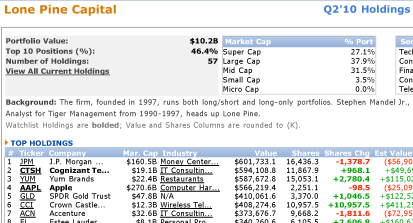 The database contains 13F holdings since Q1'07. Unlike other services we also parse Puts, Calls and Debt holdings (since Q3'09). In addition, we include all 13G and 13D holdings. Daily and weekly feeds are available for quant models and exporting to your internal systems. THE INFORMATION PROVIDED TO YOU HEREUNDER IS PROVIDED "AS IS" AND TO THE MAXIMUM EXTENT PERMITTED BY APPLICABLE LAW, INSIDERSCORE, LLC AND IT LICENSORS, BUSINESS ASSOCIATES AND SUPPLIERS DISCLAIM ALL WARRANTIES WITH RESPECT TO THE SAME, EXPRESS, IMPLIED AND STATUTORY, INCLUDING WITHOUT LIMITATION ANY IMPLIED WARRANTIES OF MERCHANTABILITY, FITNESS FOR A PARTICULAR PURPOSE, ACCURACY, COMPLETENESS AND NON-INFRINGEMENT. TO THE MAXIMUM EXTENT PERMITTED BY APPLICABLE LAW, NEITHER INSIDERSCORE, LLC NOR ITS OFFICERS, MEMBERS, DIRECTORS, PARTNERS, AFFILIATES, BUSINESS ASSOCIATES, LICNESORS OR SUPPLIERS WILL BE LIABLE FOR ANY INDIRECT, INCIDENTAL, SPECIAL, CONSEQUENTIAL OR PUNITIVE DAMAGES, INCLUDING WITHOUT LIMITATION DAMAGAES FOR LOST PROFITS OR REVENUES, GOODWILL, WORK STOPPAGE, SECURITY BREACHES, VIRUSES, COMPUTER FAILURE OR MALFUNCTION, USE, DATA OR OTHER INTANGIBLE LOSSES OR COMMERCIAL DAMAGES, EVEN IF ANY OF SUCH PARTIES ADVISED OF THE POSSIBILITY OF SUCH LOSSES, ARISING UNDER OR IN CONNECTION WITH THE INFORMATION PROVIDED HEREIN OR ANY OTHER SUBJECT MATTER HEREOF. The contents and appearance of this report are Copyrighted INSIDERSCORE LLC, 2019. InsiderScore is a trademark and service mark of InsiderScore, LLC. All other trademarks mentioned are trademarks of their respective companies. All rights reserved.